For places called Milltown, see Milltown. "Mill village" redirects here. For other uses, see Mill Village. In the United Kingdom, the term "mill town" usually refers to the 19th century textile manufacturing towns of northern England and the Scottish Lowlands, particularly those in Lancashire (cotton) and Yorkshire (wool). Some former mill towns have a symbol of the textile industry in their town badge. Some towns may have statues dedicated to textile workers (e.g. Colne) or have a symbol in the badge of local schools (e.g. Ossett School). Accrington, Bacup, Barnoldswick, Blackburn, Burnley, Calder Vale, Chorley, Colne, Darwen, Nelson, Oakenclough, Padiham, Preston for others see table below. The list below includes some towns where textiles was not the predominant industry. For example, mining was a key industry in Wigan and Leigh in Greater Manchester, and in Ossett in Yorkshire. In general, these towns wear a monotonous sameness of aspect, physical and moral... 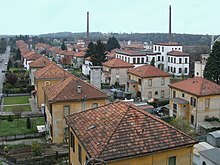 In fact, the social condition of the different town populations is almost as much alike as the material appearance of the tall chimneys under which they live. Here and there the height of the latter may differ by a few rounds of brick, but in all essential respects, a description of one is a description of all. The town grew out of a textile factory founded in 1833 by the sons of Feliks Lubienski, who owned the land where it was built. They brought in a specialist from France and his newly designed machines. He was French inventor, Philippe de Girard from Lourmarin. He became a director of the firm. The factory town developed during the 19th century into a significant textile mill town in Poland. In honour of Girard, 'Ruda Guzowska' as the original estate was called, was renamed Żyrardów, a toponym derived of the polonised spelling of Girard's name. Most of Żyrardów's monuments are located in the manufacturing area which dates from the 19th and early 20th centuries. It is widely believed that Żyrardów's textile settlement is the only entire urban industrial complex from the 19th-century to be preserved in Europe. Beginning with Samuel Slater and technological information smuggled out of England by Francis Cabot Lowell, large mills were established in New England in the early to mid 19th century. Mill towns, sometimes planned, built and owned as a company town, grew in the shadow of the industries. The region became a manufacturing powerhouse along rivers like the Housatonic, Quinebaug, Shetucket, Blackstone, Merrimack, Nashua, Cocheco, Saco, Androscoggin, Kennebec or Winooski. In the 20th century, alternatives to water power were developed, and it became more profitable for companies to manufacture textiles in southern states where cotton was grown and winters did not require significant heating costs. Finally, the Great Depression acted as a catalyst that sent several struggling New England firms into bankruptcy. ^ "Steel statue tribute of mill girl". 24 July 2018 – via news.bbc.co.uk. ^ Powell, Rob (1986). In the Wake of King Cotton. Rochdale Art Gallery. p. 12. ^ "Crespi D'Adda UNESCO - Sito ufficiale" (in Italian). Retrieved 2019-02-05. ^ "Associazione Amici della Scuola del Villaggio Leumann" (in Italian). Retrieved 2019-02-05. ^ "Abitare a Saronno tra '800 e '900" (PDF) (in Italian). Retrieved 2019-02-05. ^ "Villaggio operaio della Filatura" (in Italian). Retrieved 2019-02-05. ^ Chisholm, Hugh, ed. (1911). "Girard, Philippe Henri de". Encyclopædia Britannica (11th ed.). Cambridge University Press. ^ WRITER, ALAN BURKE STAFF. "Leather goes to War at Peabody's Leather Museum". ^ "Peabody Institute Library : Online Collections". peabodylibrary.pastperfectonline.com.